Manchester United have confirmed the departure of defender Axel Tuanzebe on a season-long loan to Aston Villa. The 20-year-old has agreed to continue his football education at the Midlands club after spending the second half of last season on loan at the club. Tuanzebe is highly rated by United chiefs but is yet to solidify his place in the first team since his debut for United some seasons back. United have been in search for a centre-back all through the summer and it was thought by some club insiders that Tuanzebe could be given a chance to impress. However, this does not seem to be the case as Aston Villa have snapped the defender as they seek to make a push to the EPL at the second time of asking. Tuanzebe had spoken of his wish to fight for a spot at Old Trafford earlier during the pre-season but it looks like a loan move would suffice for the player this season. 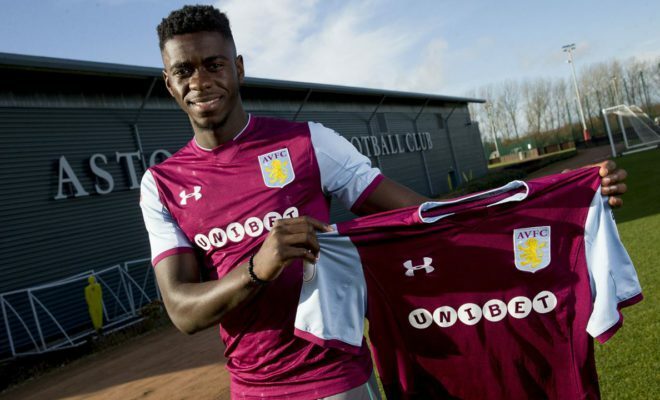 Speaking to the Aston Villa website Tuanzebe expressed his delight in returning to Villa park . He also spoke of his desire to help the club achieve its goals for promotion this season. “It’s great to be back. This is a big, big club and to represent it again is a big honour for me. The loaning out of Tuanzebe this late into the transfer window indicates that United are close to signing a new defender. club sources had revealed that the Red Devils are close to signing Spurs star Toby Alderweireld in a £60 million deal. Tuanzebe joins the likes of Joel Pereira (Vitoria Setubal), Dean Henderson (Sheffield United), Cameron Borthwick-Jackson (Scunthorpe United) as players on loan from United this season.